A lot going on this week in the Rotten Watch world. Zac Efron gets to become a little more adult, Steve Carrell and Paul Rudd become a little more juvenile and cats and dogs team up to make one ridiculously stupid looking flick. So goes the landscape of summer movies. We often need to wade through the brainless to get to anything of substance or at least anything high on entertainment value. But that doesn't stop movie studios from throwing stuff out there to get those wallets open and people standing in box office lines. Let's take a look at what this week has to offer. There's nothing better in this world than making fun of people behind their back. They can't fight back and it's open season on their personalities, foibles and quirks. Maybe the only thing better than making fun of them behind their back is making fun of them right to their face, especially when they're too stupid to get it. What an ego boost. And that's why Dinner for Schmucks looks pretty hilarious. Who wouldn't want to be in a situation where they invited the biggest dopes for a contest/dinner showing off the world's collective stupidity? I predict this movie spawns a rash of theme dinner parties around the country. So when you take a great concept and attach a plethora of comedic personalities and styles to the cast, a funny movie is forthcoming. There's Steve Carrell with his goofy, lovable loser comedic persona. There's Paul Rudd and his snarky do-gooder attitude. And finally Zach Galifianakis brings along the “what weird thing is this guy going to do next?” brand of laughs. That's a winning lineup and those are only the top three in the billing. Dinner for Schmucks is Jay Roach's first big budget directorial gig since 2004's Meet the Fockers and he's basically hopped between the “fresh” and “rotten” side of the fence for his career. But this flick looks too good to miss. The Rotten Watch for Dinner for Schmucks is 72%. I can't honestly say I've ever seen a Zac Efron movie, me being an adult male and all, but it's easy to see why the guy is so damned popular. He's good looking. Seems nice enough. Great hair (that's from a bald guy). And after watching the trailer I even caught myself thinking, “Man in a few years and a couple of serious roles, this kid could make some legitimate films.” This probably isn't the one, but the kid is at least trying. He already began the post-High School Musical transition away from teeny-bopper oblivion with Richard Linklater's Me and Orson Welles (82%). And although 17 Again (57%) is on the resume, he is growing up a bit. Now he reunites with director Burr Steers (17 Again) playing Chaz St. Cloud in a story about a kid who can't leave his dead brother behind in order to explore the world. Sure it the whole thing often seems cheesy and some of the trailer dialogue is cringe-worthy, but there's a sense of legitimacy to the whole production. Playing Chaz should give Efron a chance to run the emotional gamut on screen. He has to be devastated, confused, in love, tortured and hopefully happy. That's a tall order for a guy who is mostly known for his singing, dancing and beach body. Even if the whole thing is probably a fair bit predictable, I can't imagine critics openly despising Charlie St. Cloud. It'll tug on heartstrings with the dead brother angle, have girls sighing deeply at a grown up Efron who now drinks alcohol, and give everyone a chance to see Zacky-boy fall in love on screen. Geez, who doesn't want to see that? (Probably most adults, but whatever.) 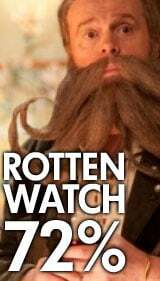 The Rotten Watch for Charlie St. Cloud is 53%. And now it's time to hand out this week's awards. Winner for Most Idiotic Movie Poster (dog and cat flying through air wearing aviator goggles) is Revenge of Kitty Galore. Winner for Worst Movie Tag Line (“Like real spies, only furrier”) is Revenge of Kitty Galore. Winner for Longest Two Minutes of My Life (Movie Trailer Category) is, okay you get the point. To say this movie looks stupid is an insult to the stupid people out there who actually mean well. Kitty Galore is about cats and dogs spying together for reasons not totally made clear in the trailer. They're on the hunt for Kitty Galore (a hairless cat) for reasons unknown and the whole trailer unfolds like a giant dog turd put on screen to generate a few bucks and mark the end of Chris O'Donnell's movie career. But here's what I love about voice acting: Even though this has to be terrible, they've managed to land huge names hungry dolla-bills. Neil Patrick Harris, Bette Midler, James Marsden, Michael Clarke Duncan, Nick Nolte and Christina Applegate are all collecting big paydays for a movie likely to make critics scrape their eyeballs out. 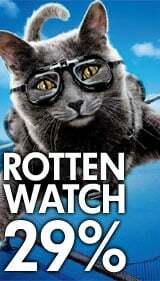 The Rotten Watch for Cats and Dogs: Revenge of Kitty Galore is 29%. Recapping: Last week was a “Big Winner” and “Pretty Close to a Winner” kind of week for the Rotten Watch. Salt (Predicted 52% Actual 56%) had critics split down the middle and nailing it within 4% had me doing some high fives around the living room. (Wife not impressed). Meanwhile, with Ramona and Beezus (Predicted 55% Actual 70%) I aired on the side of positive, but didn't think it would trend quite so high. I should have known everyone loves Beverly Cleary. Next week Mark Wahlberg and Will Ferrell fight hilarious crime and a dance movie gets put in 3-D for some reason. It's going to be a Rotten Week!